Music, Inc. (ASCAP)) except for Black Eyed G’s, composed, arranged and orchestrated by Leon Pendarvis, (Pin Wheel Music, Inc. (BMI)). Soul Surfin' and Chili Wa composed and arranged by S. Pelton, (Magic Beat Music, Inc.(ASCAP)), J Tropea and Chris Palmaro. 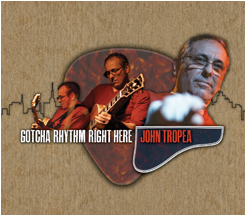 Mastering Engineer: Jon Tropea Jr.